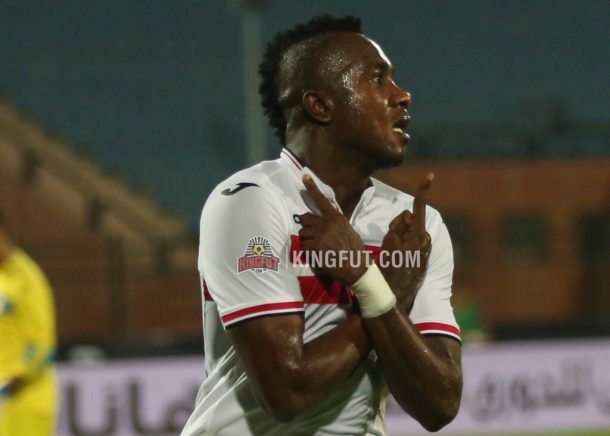 Zamalek forward Kabongo Kasongo has scored in DR Congo’s 1-1 draw with Congo Brazzaville in the fifth round of the 2019 AFCON qualifiers. The 24-year-old started the game following Britt Assombalonga’s injury during the warm-up and repaid the faith shown in him by scoring his side’s only goal of the game. Kasongo opened the scoring in the 24th minute, but Thievy Bifouma’s 38-minute equaliser meant that both sides will share the points. The strike is Kasongo’s first international goal in his only second appearance for his country after he made his international debut last May in a friendly against Nigeria. The draw kept DR Congo’s hopes alive as they currently sit third with six points, only two behind leaders Zimbabwe and one behind second-placed Liberia. Kasongo’s side will host Liberia in the final round of the qualifiers and will need to win to secure their place in the final tournament in Cameroon.